There are two species in the genus Sporopipes, this name meaning "to look for seeds". They are very small, social weavers of semi-arid parts of Africa. The two species do not overlap in distribution. Both species have moustachial stripes. They are monogamous, and build single nests of straight grass stems. Some courtship behaviour resembles that of species in the waxbill family. The sexes are alike. The Scaly-feathered Finch Sporopipes squamifrons forages on the ground, feeding mainly on small seeds, with insects being fed to their young. They drink when water is available but, remarkably, they can survive for months without drinking as they can produce metabolic water from its diet of dry seeds. This species is found in pairs or flocks of up to 20 birds, and it regularly flocks with waxbills. Scaly-feathered Finches sleep communally in a nest through the year, with up to 12 birds using one nest, to keep warm on icy winter nights. Resting in the nest during the day also enables the birds to avoid the hottest times in summer. The Scaly-feathered Finch has no recognised subspecies, although several have been proposed in the past. This species is found through southern Africa and extreme southern parts of Angola and Zambia. There are disjunct populations in the Eastern and Western Cape. 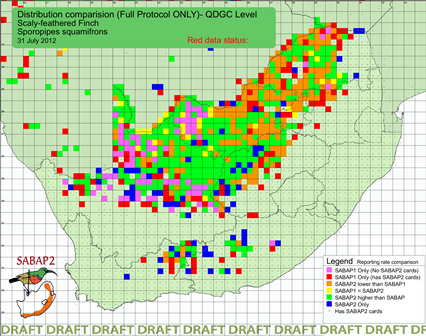 In South Africa SABAP2 shows higher reporting rates than SABAP1 (green on map) in the area around Warrenton. In the north-eastern part of its range in South Africa, there is a lower reporting rate in recent years. Is this species becoming more common in the south parts of its range? The Scaly-feathered Finch nest is an untidy, rugby-ball shaped mass of grass stems and grass seed heads. The nest is placed in trees or bushes at 1-4 m above the ground. The incubation period is fairly short at 10-12 days, as is found in many passerines in arid areas. Incubation is by the female, while both sexes feed the nestlings. The young continue to sleep in the nest for several weeks. See a summary of PHOWN records for the Scaly-feathered Finch here. There are few PHOWN records, so please look out for nests of this species and submit to PHOWN (PHOtos of Weaver Nests) via the Virtual Museum upload site. Look for the birds at the nest to prevent confusion with waxbill nests. Photo: Scaly-feathered Finch nest, phown 1542.